If your Salesforce organization uses record types for leads, contacts, accounts, and/or opportunities, you can map them to HubSpot as custom properties. This allows you to use the record type for segmentation in HubSpot. You can map Salesforce record types to HubSpot custom properties with one of two field types: single-line text and dropdown select. Please note: this method will only map the Record Type ID value to HubSpot, and not the Record Type Label value. If you want to map the Record Type Label value to HubSpot as well, map Salesforce record types to a HubSpot dropdown select custom property. To map Salesforce lead/contact record types, click the Contact properties tab. To map Salesforce account record types, click the Company properties tab. To map Salesforce opportunity record types, click the Deal properties tab. In the upper right, click Create a property. In the right panel, enter a Label for the custom HubSpot property. In the Field type dropdown menu, ensure Single-line text is selected. In the bottom left, click Create. In the CRM Objects section, to the right of Contacts, Companies, or Deals, click Manage mappings externalLink. Click Add new field mapping. Under What HubSpot property would you like to map?, select Choose Existing HubSpot Property. Click the Select a property dropdown menu and select the newly-created custom property. Under What Salesforce field would you like to map it to?, click the Select a field dropdown menu and select Record Type ID. Under When should HubSpot data update the corresponding Salesforce field?, select Use Salesforce value, I only want Salesforce data to update the HubSpot property. After the mapping is created, resync existing HubSpot contacts to populate the custom property with the Salesforce record type data. If not, the custom property will only be updated the next time the record is updated in HubSpot or Salesforce. If you have a more advanced understanding of HubSpot and Salesforce, you can map a Salesforce record type to a custom HubSpot dropdown select property. This method allows the Salesforce Record Type Label value to be mapped along with the corresponding Salesforce Record Type ID value. Click the Field type dropdown menu and select Dropdown select. In the option Enter Label field, enter a Salesforce record type's Record Type Label value. Click + Add an option and enter another Salesforce record type's Record Type Label value. Repeat this step for each record type. In the list of properties, click the name of the newly-created custom property. 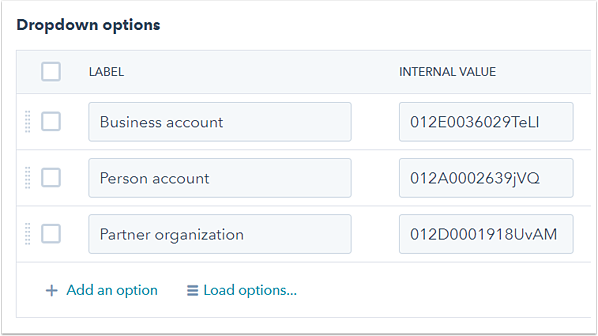 In the Dropdown options section, enter the corresponding Salesforce Record Type ID value for each Record Type Label value in the Internal value field. Learn how to find the ID of a Salesforce record type. Please note: if new record types are added to Salesforce, the custom HubSpot property must be manually updated with the new Record Type Label and Record Type ID value pairs.